The Villager B series stove is a BH,BL or Flatmate stove. This is the mid range model and therefore probably more used. is available with a flat top, low canopy or high canopy. There is an optional boiler & multi fuel kit available for this Villager model. 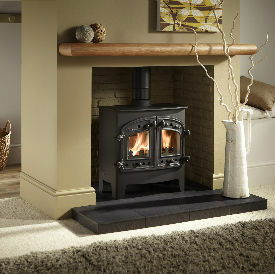 Stove expert replied: Have you had the chimney swept? Is there an air brick in the room? Leave more air wash to help with the draw. If still having problems suggest getting an installer to check, seems strange that is worked fine and this has now changed so I am sure this can be rectified. Have you got trees near the house that have grown since installing the stove? We have had several stoves in the past, and the villager B is by far the best we have had, and would certainly buy one again. love this stove. great build quality.